I have four children, so the chances of my Wife and I watching a grown-up movie are slim at best - so I take the opportunity to catch up on films when I fly. On the way back from NY recently, I watched "Warm Bodies" a romantic comedy with zombies (I'm not kidding). Take a look at the first four minutes - at around 1:20 there's a scene where our protagonist imagines life before the apocalypse. (Click here to jump to it, or watch the clip). The more I look around the real world, the more this clip makes me laugh. We spend so much time stuck in our virtual worlds that we can forget about the real people around us. Engagement strategies can feel like this too, I've seen many companies draw up plans to improve employee engagement by focusing entirely on the electronic aspects of communication, and forget the human interaction element. All of these are worthy things, but they all require an individual to make the effort to seek out the information and work with it. The problem is - those that do are probably your most engaged employees already. 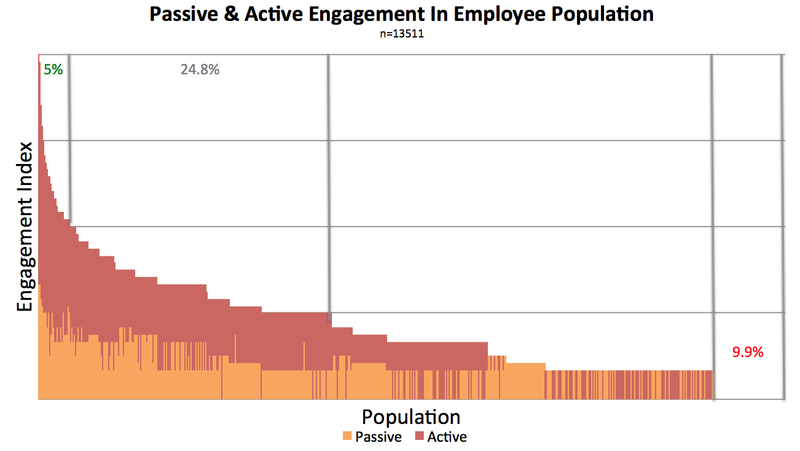 Take a look at the chart below - this shows a company of 13,500 employees and their level of engagement. Passive engagement is determined by opting in to certain activities, active involves making a contribution. This is the picture 12 months into an engagement program. 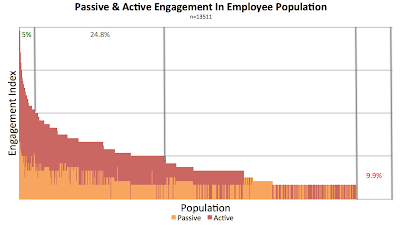 Only 5% of the population are in the top two quartiles of engagement, but the majority of that engagement is active. Also note the 9.9% who are not demonstrating any engagement at all - this is not uncommon, and having the expectation that all employees will be engaged in all things is unrealistic - it doesn't make them bad people, extensive interviews revealed that these are folks who are simply happy to do their work well, content in their role. There is an underlying story here though, and it's that of human engagement. The effect that the top 5% had on the employee population here was astounding. These were the people who picked up the phone, walked around the office, created the atmosphere for change and generally became cheerleaders for increased engagement. Looking at their influence on a geographic and organisational basis proved their value beyond all doubt. So I have three things to leave you with today. Number 1 - what are YOU personally doing to promote engagement in those around you? Enthusiasm is contagious, and can be expressed in electronic form - but is often much better expressed through direct interaction with the people you work with. Number 2 - what kind of active engagements are you promoting? 'Change Jams', interactive message boards and group events are all good places to start - but make sure that actions are taken based on the feedback you get. Number 3 - are you measuring engagement? If not, then you are relying on hearsay and instinct to improve things - and whilst instinct and passion play a part in this, without hard data you are working in the dark. It's not difficult to do, and it doesn't cost a lot. If you're struggling with measurement, then please reach out directly to me at mark.ellis@culturetransform.com or at CultureTransform.com , and I'll do the best I can to help.